You’ve definitely not heard this one before. In the shadows of the Pyrenees in Southern France, away from the glow of the crystal bucket and constant flow of social media, resides a collective which has purposefully chosen this remote locale from which to strike out in all directions with their extraordinary music. As is befitting a band which counts a Scot, an Italian, a Frenchman, a brace of tap-dancing sax players (one of them Belgian) and a Jewish percussionist among its number, this is not a project that is without its disregard for convention and with a willingness to accept diversity as one of its pillars. 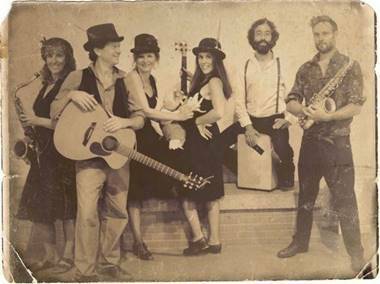 Fergus McKay & Nothing Concrete have the bohemian swagger of prime Dexy’s but with a more irreverent edge, an acoustic-led combination of folk, 30’s swing jazz and a bluesy country cabaret polka which is quite unlike anything else. Their sound reflects their lifestyle, shunning technology where possible and returning to all things elemental, from their self-sustained crops to embracing acoustic instruments and the ancient art of storytelling through song. Having travelled extensively over the years all around Europe, Fergus has soaked up the lives of many who he has observed and has woven so many of them into his songs. The band’s ethos is to inspire those who crave tranquillity away from the rat race to follow their hearts and to take the leap of faith as they have. Having built their own studio in an old semi-abandoned farm house surrounded by gypsy wagons and the wilds of nature, the album was recorded in a truly organic way. The female members of the band, Gaia, Saskia and Angie, all balance their full-time recording and touring with the band alongside raising their children – a concept which they hope will inspire others who are reticent to embrace alternative ways of living. Old Black Crow was written about ten years ago and was part of Fergus’ busking set all over Europe. The song tells tells of a mysterious getaway - a group of renegades on the run, overseen by an old black crow. The accompanying video sees the band aboard a double decker bus converted into a theatre, interspersed with clips from Georges Méliès’ 1906 film, A Desperate Crime – an unlikely collision of artforms which absolutely typifies the unpredictable nature of a quite unique band.